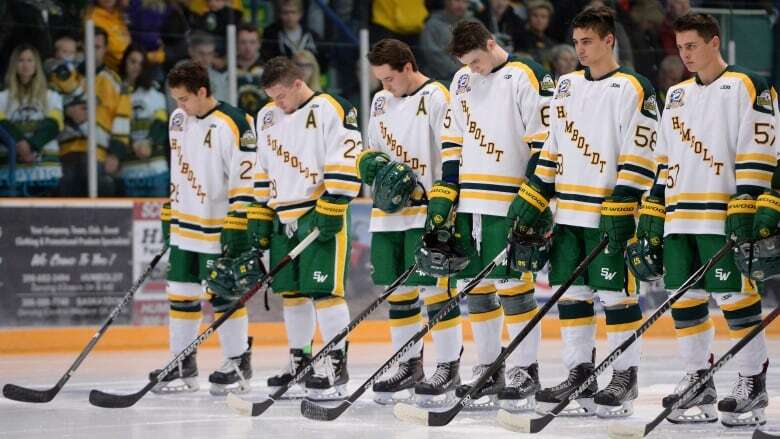 The Humboldt Broncos came up short in an emotional first regular-season game since the team's bus crashed in April, killing 16. 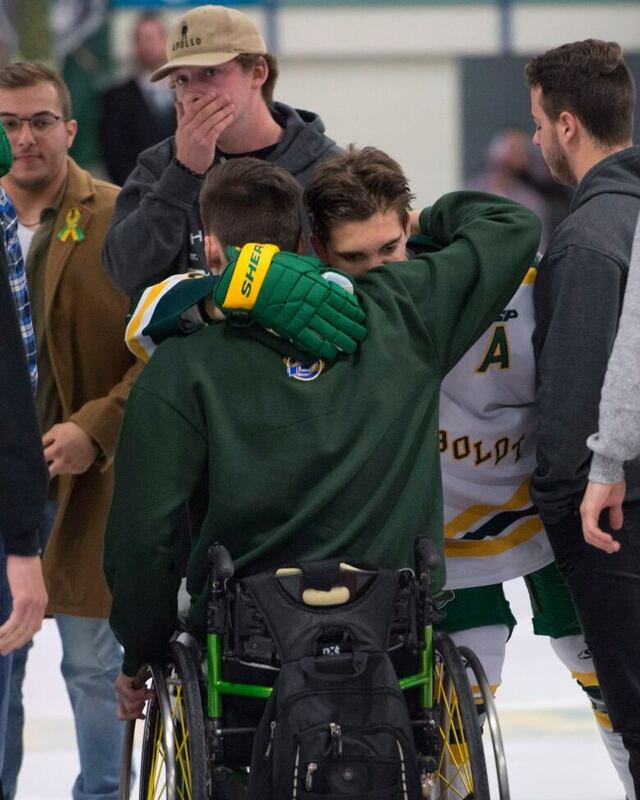 It was a night marked by sadness, but also celebration as the team emerged from tragedy with the help of many of the players who survived the deadly crash. 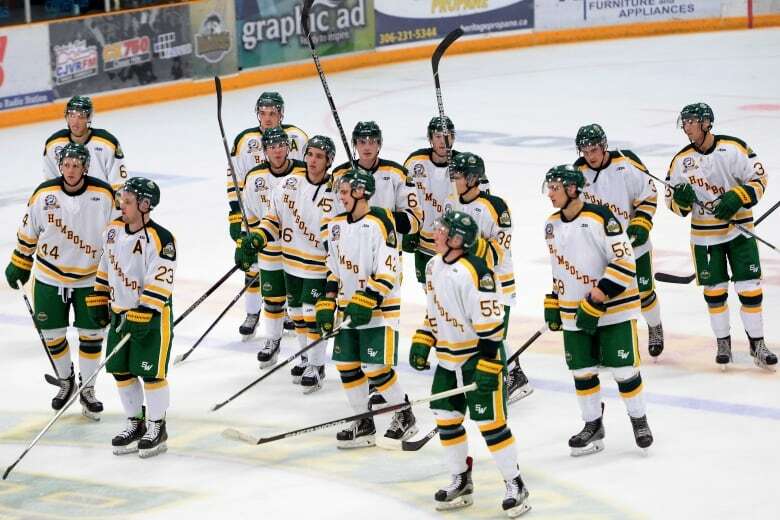 The Humboldt Broncos tried to emerge from the grips of tragedy Wednesday night by playing some hockey and raising banners to honour all the people who were on their team bus when it crashed in April. Family members and fans cheered through tears at Elgar Petersen Arena as 29 yellow and green flags were unfurled honouring the 13 injured and remembering the 16 dead. "We know that, while the darkness is much less, it will never truly leave us as it holds the love that we have left for those who are no longer with us and those who have been impacted by this tragedy," said former Broncos president Kevin Garinger, who was the face of the team in the aftermath of the crash. The Broncos came up short in an emotional first regular-season game before the ceremony. The Nipawin Hawks, last year's Saskatchewan Junior Hockey League champions and the same team the Broncos were travelling to face when the crash happened, rode two late second-period goals to a 2-1 victory. But it was a night where the score was secondary. The evening began with eight of the surviving players who aren't with the team anymore dropping the puck in the ceremonial first faceoff. Kaleb Dahlgren, who now plays university hockey in Ontario, said it was important to be there. "I think it is a step in the healing process," he said. "Tonight definitely helps heal the wounds but it won't for sure heal everything. There is still lots that needs to be done." Some of the surviving players' injuries were still apparent. 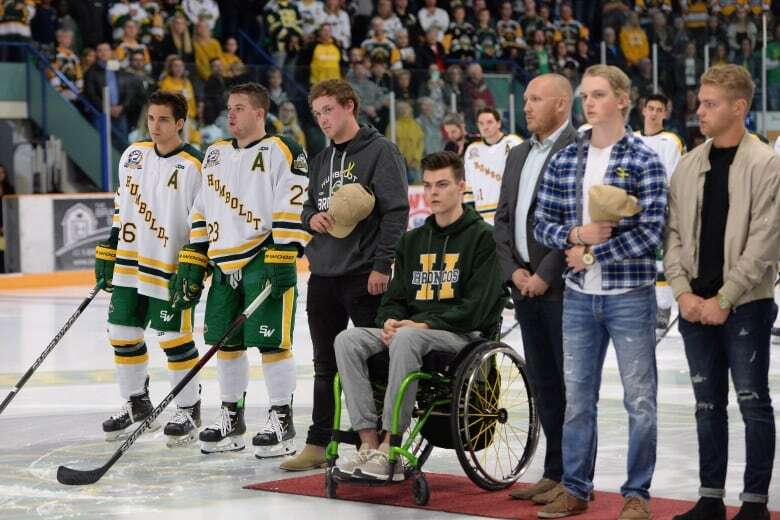 Xavier Labelle, who was initially mistaken as being among the dead, has a large scar running across his forehead down to his eye, while goaltender Jacob Wassermann used a wheelchair to get onto the ice. And while some of the survivors dropped the puck, two others suited up and played. Brayden Camrud and Derek Patter are the only two players who were involved in the crash and are back on the Broncos this season. Camrud overcame a severe concussion, loss of feeling in one of his arms and neck issues. His play stood out for the Broncos Wednesday night. Dahlgren's father, Mark, was struck by the tribute photos outside the arena as he and his son pulled up. "I just saw all the pictures of the people that passed on the bus and I just looked over at him and said: 'Sure glad your picture's not up there,"' he said. "We're the lucky ones and we don't take it for granted. Every day we are appreciative to have him with us." The game was difficult for at least one of the players who suffered lifelong injuries in the crash. Former Broncos player Ryan Straschnitzki, who was paralyzed from the chest down in the crash, opted not to watch the season opener in person. He wasn't even sure he wanted to watch the game on TV even though it's been on his mind. "It's not my team anymore," Straschnitzki said earlier. "I wish them the best of luck, but it's not my team and it's going to be hard to watch knowing that I should be out there." "He should be playing in this home opener today as with the other players," he said. "It's a difficult day." The team's new coach, Nathan Oystrick, said he thought his players handled the night well. "It was emotional, as I'm sure it was for everyone else, but [they] battled through it," he said. "I thought the guys did a really good job." "I think people were ... really looking forward to the season getting going and seeing the new team and seeing the results of a lot of work from a lot of people getting the team back on the ice," he said. "In my mind, it's kind of a new page, a new chapter in the book I guess — moving forward as a community and as a team." The Broncos will board a bus again on Friday and head to Nipawin for a rematch. Team president Jamie Brockman said the organization is grateful for all the support it has received from across Canada and the world. "I think we did right by last year's team here."